There are many temples and pagodas in Ho Chi minh City, the majority of them being Buddhist or Taoist. They vary in size, with the biggest pagodas being highly decorated, and filled with many religious relics. The most popular and the most impressive of Cholon’s Chinese pagodas, the temple is dedicated to Thien Hau, Goddess of the Sea. She is not a deity of Buddhism or Taoism, but is connected to both religions. When the temple was established in mid eighteenth century, the Chinese community tended to be made up of merchants and seafarers who worshipped Her, in hope of a safe journey. Nearby Quan Am Pagoda is another favourite for locals and tourists alike. It was established by Cholon’s Buddhist community and dedicated to the bodhisattva Quan Âm. Phuc An Hoi Quan Pagoda is also close by. Built in 1956, the Xa Loi Pagoda is of interest for its past rather than its beauty as a Buddhist place of worship. It was the centre of Buddhist demonstrations in Saigon against the regime of Ngo Dinh Diem in 1963, that presaged an escalation of US involvement in Vietnam. Today, Xa Loi Pagoda continues to function as a place of worship and while it is most definitely not one of the country’s most atmospheric pagodas, historians will find a visit rewarding. Originally built in 1744, it is one of the oldest pagoda in Saigon. The garden in the front features the ornate tombs monks, as well as a rare bodhi tree. Inside the temple, there are just two simples rules: no hats and no smoking (though most do); wearing shoes is allowed. One well-known monk looks after the sick and suffering (and tells fortunes) in a side room. Don't miss the large outbuilding just to the right of the entrance - inside are aisles of shelves with colorful urns of ashes, Chinese pots with red lights, candles, and offerings. It is possible to climb the stupa for a view of Ho Chi Minh City, but the main attraction is the wooden pagoda. Also known as the Jade Emperor Pagoda or the Tortoise Pagoda, it is one of the most interesting pagodas in Vietnam, the Emperor Jade is filled with smoky incense and fantastic carved figurines. It was built by the Cantonese community around the turn of the 20th century and is still buzzing with worshipers, many lounging in the front gardens. The dominant figure in the main hall is the Jade Emperor himself; referred to as the "God of the heavens." He decides who will enter Heaven and who will be refused. Located in the north of the city, the Vinh Nghiem Pagoda started to be built in 1964, with construction lasting 7 years. 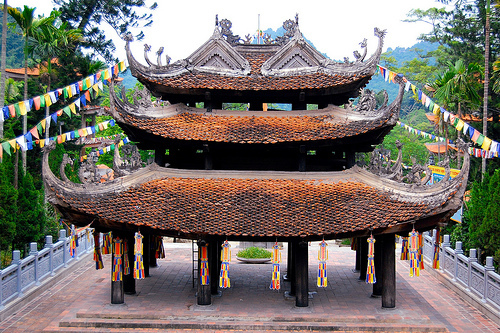 Famous for the Kwan-Yin tower, the pagoda is known for its Asian architecture. The tower is 35 m tall, with significant Japanese influences, and is one of the tallest Buddhist structures in Vietnam.